ST. GEORGE – Next week, hundreds of thousands of people will participate in the Great Utah ShakeOut, a statewide drill promoting emergency preparedness in the event of an earthquake. Though it may rarely feel like it, Utah is earthquake country. Utah experiences over 700 earthquakes annually, according to data from the University of Utah. However, most are so small that only about 2 percent of them are ever felt. In southwest Utah, the last noticeable quake that occurred in the region happened the morning of July 4, 2015 near Panguitch. Located a little over one mile south of the town, the 3.9 quake shook the area, though no damage was reported. A few days before that, on May 22, a 4.8 quake hit 23 miles south-southwest of Caliente, Nevada, and was felt across Lincoln and Clark counties and southwest Utah as far as Hildale. At some point in the future, a bigger quake will hit, said Josh Thayn, director of risk assessment at Dixie State University. The fault lines Thayn mentioned are the Hurricane fault and the Washington fault. The Hurricane fault is considered by seismologists to be the more active of the two, though both are equally capable of generating large quakes. Like other organizations and businesses across Utah, Dixie State is participating in the Great Utah Shakeout next Thursday at 10:15 a.m.
“The drop, cover, and hold on concept – that’s been proven to save lives when we have earthquakes,” Thayn said. In addition to the exercise, Dixie State and other participants in the GreatShakeOut will be conducting additional drills and training to help the school’s staff, faculty and student body be better prepared. The mass-emergency alert system will send the notifications out over texts, as well as override television and computer screens across campus in order to get the message out. The university’s Community Emergency Response Team will also be deployed to practice stair rescue, and a class for the school’s leadership will be held on how to run an incident command post, Thayn said. The 6.5 earthquake DSU will be training for is within the range that could hit the vicinity of Washington City, according to a scenario posted on the Great Utah ShakeOut website. An earthquake of that magnitude could cause an estimated $404 million in damage, displace over 300 households and possibly kill approximately 4-14 people. Other Southern Utah scenarios include the Anderson Junction and Cedar City segments of the Hurricane fault. The Anderson Junction scenario sees a 7.4-scale quake that causes $1.2 billion in damages, kills between 30 and 80 people, and displaces over 1,000 households. The scenario for the City Cedar segment is a 6.6-scale quake with damages of up to $115 million, displaces over 70 people and causes few fatalities. In the more densely population regions like the Wasatch Front, the estimates in damage, deaths and displacement are much higher. 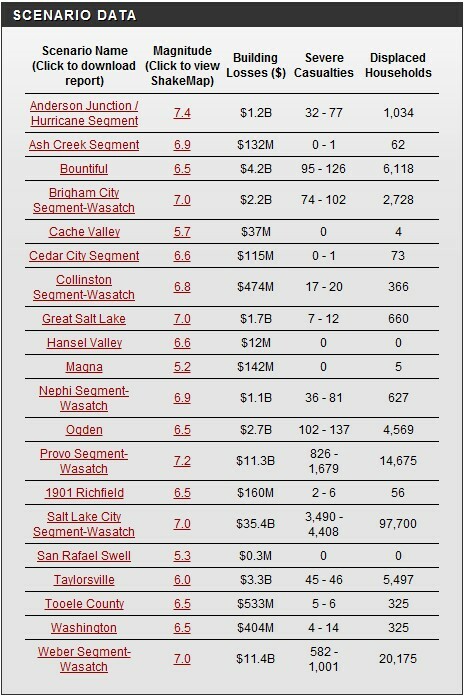 A full rundown of earthquake scenarios across the state can be found on the Great Utah ShakeOut website. In case of an earthquake or other kind of emergency, Thayn and emergency preparedness advocates recommend having an emergency plan and a 72-hour kit on hand. “Plan out what to do and where to go,” Thayn said. Tips on how to create an emergency plan and a 72-kit can be found on BeReadyUtah.gov. Utah joined the international ShakeOut community in 2012. Over 945,000 Utahns participated in the drill that year. As of 9 p.m., Friday, 930,000 people have signed up via the website to take part in the drill next Thursday. To join the drill, visit the Great Utah ShakeOut. News LIVE: Nevada earthquake, aftershocks; road impacts; last updated 4:15 p.m.